In preparation of an upcoming post on Black-crowned Night Herons, and in honor of Halloween, I give you the lovely and brilliant red and orange glowing pumpkin stares of these lovely wetland waders. I’m always captivated by birds’ eyes, but some are especially striking…. Great shots of that reclusive little beauty. In particular, the juvenile! Identifying a youngster is difficult because of all the camouflage – streaked head and all. Were they really that blue? I’ve seen Black Crowns in several different colors – but they ALL have those spooky eyes. Great catch, ma’am! Thanks so much! I was really happy to get as close as I did with these two guys — like you say, they’re usually quite tough to snap, and so shy, sticking close to their trees! LOVE their eyes though — such a contrast! Happy Halloween FeyGirl and thank you for sharing these awesome photos! I agree with you about their eyes – amazing color. Happy Halloween to you!! Thanks so much! Thanks so much! I’m *very* fortunate to be surrounded by some fascinating birds in my area, and there’s never a want for great opportunities to nab them, on our walks and hikes. Such unusual guys; love ’em all! Those are truly stunning!! I agree about the birds eyes. When I had my farm, I took numerous pictures just of their eyes. Simply fantastic. Exactly what I try to do, whenever possible! They’re so very different, so amazing… I love the contrast of these herons’ eyes, though. They literally glow in the wetlands, they’re so intense. I agree… They’re masterpieces of striking contrast! Happy Halloween to you too!! Bird’s eyes are so beautiful and interesting!! 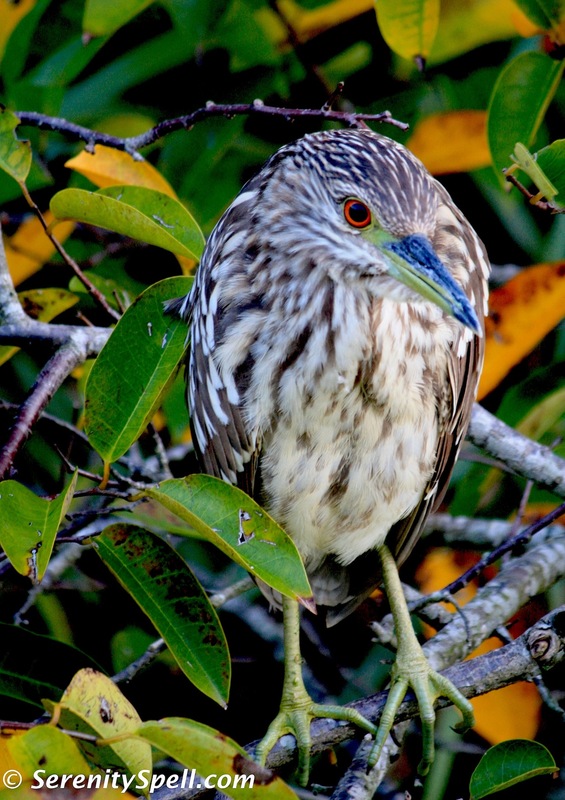 Thanks for sharing this particular seasonal coloring of the night heron eyes!! Happy late Halloween! I hope you had some cute Trick-or-Treaters!! Love the first shot with the nictiating membrane caught halfway across the eye……cool shot…. AH! Someone was asking if there was a membrane in the first shot, and I honestly couldn’t answer…. So THANKS for that bit of education! Nice detail in these closeups. 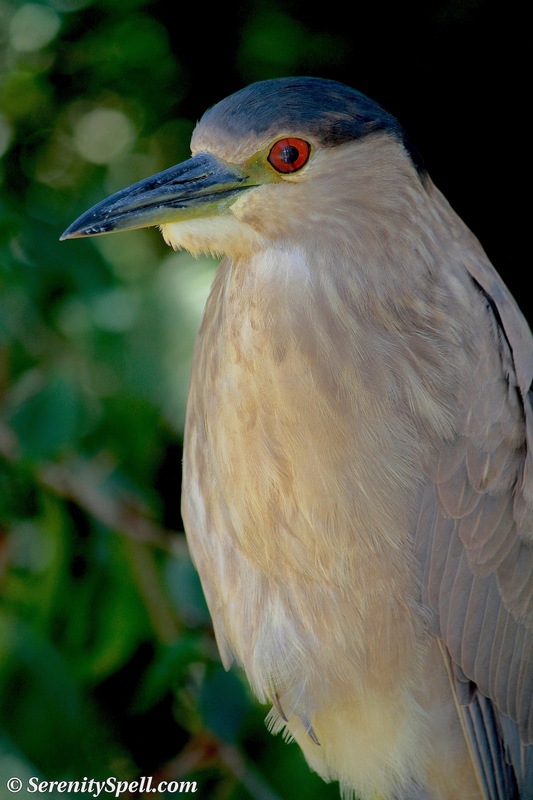 The night heron is one of my favorite birds. Fantastic portraits of the BCNH! They sure do have amazing HUGE eyes! These are great pics! Thanks so much! I was thrilled to nab them away from their precious roots and trees, heh… And somewhat close. They tend to be a bit shy. Love their eyes though — just brilliant! Absolutely stunning Feygirl ! Still jealous of all the wonderful birds you get to visit. Hope you’re getting settled back into your routine. Always tough when you’ve been out of town for a bit. Thanks!!! These guys are especially shy, so I was happy to get some close-ups of ’em. YES, INDEED, THE EYES ARE THE MIRROR TO THE SOUL. THEY ALSO SHOW HOW SMART YOU ARE OR ARE NOT AND I CAN SAY THESE BIRDS ARE SOME SMART LITTLE COOKIES!!!! Exactly! Some people don’t realize how very expressive animals can be — they scream in pain and fear, the hoot and call in excitement… And I believe their eyes are equally expressive. Wow. Gorgeous photos! Two things struck me: the bird’s eye in the top photo…is that a membrane covering half of it? I didn’t know birds had those. Also, the quote…how animal eyes communicate so many things. Can’t wait to see how you develop this! Thanks so much! You know, I’m unsure about the membrane — I would have to investigate that! I’ve always been drawn to animals’ eyes…. And while animals aren’t really silent (they scream in pain, hoot, call, etc.) — their eyes are equally expressive. Reblogged this on 2012 Spirit In Action. Such a contrast, eh? I love seeing their glow in our wetlands. You really do have some amazing bird photos – live that first one! Thanks so very much! I’m *really* fortunate to be surrounded with some amazing opportunities and models (heh) down here… Such a unique area. I loved getting such a clear look at their eyes. Beautiful photos. Apparently a lack of seeds up north has brought a new species to my bird feeders, and I’m now seeing pine siskins. I just looked up these pine siskins (I’ve never heard of them)… They’re lovely! Reminiscent of our palm warblers at a quick glance. I can’t believe it – I have more photos of night herons than any other bird because they’re all over the place. They stand around on the docks, perch on lines, fill some of the trees around various pools – including one in the middle of a traffic circle! I never would have thought them shy. Even the juveniles can be found pretty easily. I do have one photo with the eyes bright and vivid, too – but nothing like these! The colors are amazing. I’m home now, and went with my friend tonight to see the roosting birds. There were a few egrets mixed in, but most of the birds actually were ibis. There must have been at least two hundred and maybe more, including some juveniles. They came in right at sunset, and a good photo was nearly impossible. I’m going to go down at sunrise this weekend and see if I can catch them with the sun at my back, shining onto them while they’re still in the trees. Hahah! That’s great… I was at one place — a sanctuary, actually — where they had LOTS of night herons, and they weren’t very shy either. But in the wild, they’re notoriously reclusive, sticking close to their roosting trees and to the water’s edge. These guys were close to the water’s edge, but I was able to wrangle my way to ’em…. Ooooh, sunrise / sunset are always great times to grab them! Do you have glossy ibis too? They’re lovely. To see them roost en masse is quite a sight — there are a few rookeries in our wetlands, with hundreds of ibis (with egrets and herons mixed in). Just amazing!! Eyes do say a lot about animals and their moods. Certainly anybody who has a dog or cat can attest to this… but to catch birds eyes in such clarity has to be rare. Great shots. Thanks so much! And I completely agree… Anyone’s who’s looked into their eyes can sense this. ANYONE! Just because they don’t speak our language means absolutely *zilch*. Even more striking than the late Elizabeth Taylor’s violet eyes. Yes. I know if I was in the vicinity with my camera, I’d be a real pest to that poor bird. Those eyes are something else. Of course, I’d need a close-up lense. That’s exactly what I have (a 70-300)… And I try SO hard not to be *too* stalkerish, to avoid causing them anxiety. I’m in-and-out, which is sometimes quite evident in the photos, hahah!!! The eyes are amazing. Incredibly beautiful. They really are totally unique… Our Everglades birds have some fantastic eyes. I don’t know how you out-do yourself every post with more and more stunning photos!! I see your posts and mutter, “Oh. Wow.” Thanks for always sharing such stunning photos. Thanks so much for sharing our shy but lovely heron! !